At Music Center of the Northwest, we are always interested in helping schools and students gain access to the transformative power of music, regardless of means. We are especially interested in extending that transformative power to those with the greatest need in our own North Seattle neighborhood. We seek to partner with schools and other arts organizations to make high quality programming available to all students and lovers of music. With continued support, we hope to continue to make a difference throughout our region. Bring Music Center's professional teaching artists to your school, contact Ryan Schultz at ryanschultz@musiccenternw.org. 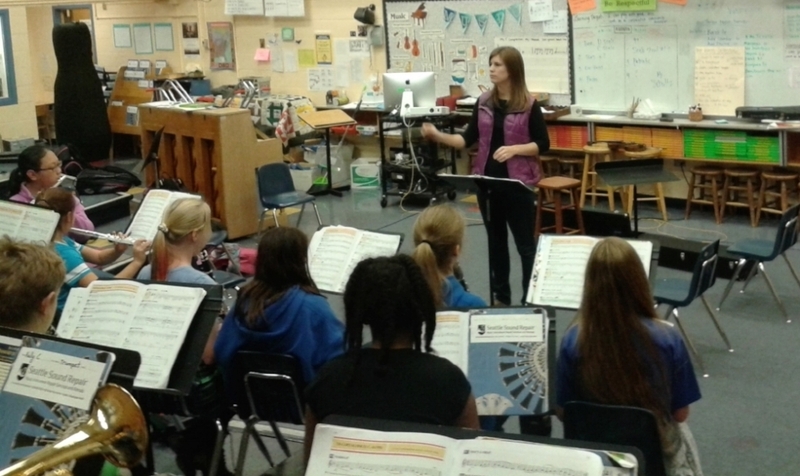 Music teachers are constantly expressing a need for specialized instruction to help aid their students in the classroom. In 2015, we began a new focus by partnering with Broadview Thomson K-8 and, in 2018, with Northgate Elementary. These schools were selected specifically due to their financial need. Music classes are constantly in jeopardy of being cut at these two schools and over half of the students at each of these schools receive lunch assistance. Their music teachers reached out to us looking for assistance and are also able to provide us with a designated, safe location to instruct students on a weekly basis. In 2016-17, we were able to donate over 45 classroom hours of like instrument group instruction. The following year, we doubled the donation to almost 100 hours and this year we will reach over 120 classroom visits of donated instruction. Music Center employs passionate musicians/teaching artists who help students grow both as musicians and as people. These faculty members have performed, studied, and trained around the world; many have earned advanced degrees and have studied at some of our nation’s finest colleges and conservatories. We focus on helping students gain musical proficiency, and also help them to develop critical thinking, communicating, and social skills. Our top-tier teaching artists can come to your school and work with your students during the school day and/or before or after school. We are also often able to host special events at our campus.